After breakfast (and after a few of us had hand-washed our clothes and hung them out to dry) we slapped on the sun cream and set off for the Victoria Memorial. We decided to walk and, thanks to Geoff’s (dad’s) fantastic navigation, managed to get ourselves there in one piece. 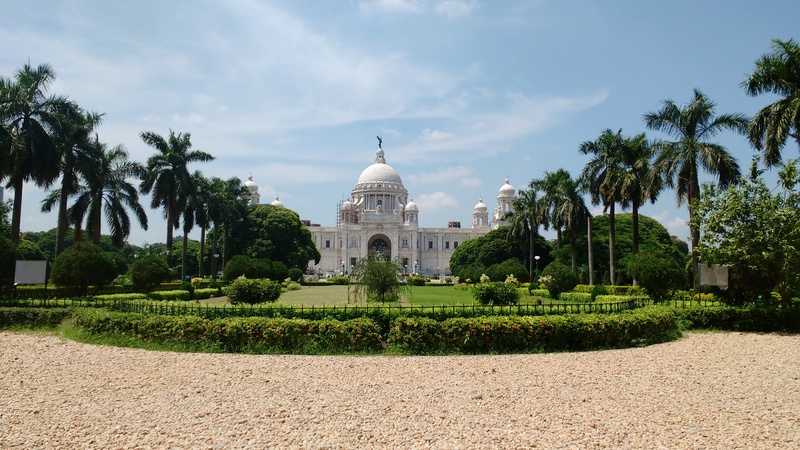 The Victoria Memorial is beautiful – it’s an oasis in the middle of a polluted city. It took us a while to actually get inside the Memorial because Indians kept wanting to take selfies with us – none of us understood why! It was great to look round inside and find out some of Kolkata’s history. I was particularly interested in reading about William Carey, a botanist and linguist (among many other things) who came to Kolkata in the late 18th century and created the first Bengali dictionary as well as publishing the first Bengali newspaper. It’s been incredibly hot today and we struggled to find some shade at lunchtime, but eventually we found some slight relief from the sun and sat and ate our packed lunches provided by the Guest House. We think they think we’re Americans as they gave us peanut butter and jam sandwiches. Oh, and spicy crisps (seriously everything is spiced here!). We then headed to St Paul’s Cathedral and had a little look round inside. Again, it was a tranquil safe haven in the middle of the busy city. On our walk back to the Guest House, we spotted several people decorating the streets with Indian flags in preparation for India’s Independence Day on Monday. On a much less happy note, we came across lots of beggars. Malnourished children, men and women reached out to us as we walked past; one even walked right up to me and tugged me on my arm. I can’t even begin to describe what this is like. Kolkata is home to some of the poorest people in the world. Seeing such poverty in such a real way is making us all reconsider our lives and the things we take for granted. It’s also making us think about what more can be done to eradicate extreme poverty – the young people on this team are extremely clever and caring people and consequently there have been lots of in-depth discussions and debates (there’s even one going on right now as I type)! Later this afternoon, we went back to Daspara for a Youth Conference organised by GNCEM. This was a super lively event. Loads of young people attended – the place was jam packed with 300+ 12-25 year olds. There were songs, games, dramas, dances… We joined in the program with a couple of sketches (and discovered just how much of a budding actor Daryl is!). It was great fun; everyone had a huge smile on their face. On our drive back to the Guest House we were able to see Kolkata at night. The event had left us in such high spirits that we started singing to our bus driver! Kolkata is a remarkable place. We are all trying to process the sadness of the poverty we are seeing, but equally, we are seeing why Kolkata is called the City of Joy. In case you were wondering, the team are doing so incredibly well. Everyone is looking out for one another and so far, throwing themselves in to this experience… and no one has been ill. Hooray! We’re all quite tired but I think that’s to be expected after the crazy week we’ve had. Tomorrow will be a bit of a down day, although we have got plans to go out for dinner as the Guest House doesn’t provide an evening meal on Sunday. We’ve been told about an Italian restaurant which is very appealing to those on the team who have been struggling with the spicy food! No blog tomorrow I’m afraid, but we’ll be back with more of what we’ve been up to on Monday.